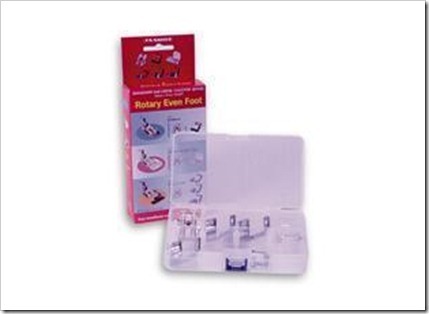 I have had a few accessory feet for my sewing machine and overlocker for over a year now and have never used them. To be honest its because I have been too scared to lol. Yep they seemed very scary to me and as I didn’t have much of a lesson from the shop that I purchased the overlocker from (I was told to refer to the pattern I was using, yeah thanks for the help) I just put it in the too hard basket. So when the fabric challenge came up I thought right it’s time that I used these accessory feet to make my items, really how hard can it be. Hubby bought the Rotary Even Foot with Rolled Hem and Bias Binding attachments for Mother’s Day 2 years ago and I have only ever used the bias binding. It makes the job so easy as bias binding is not one of my favs to sew. But the gathering foot on my overlocker well I tried it out once or twice and I just could not control the material as it feed through. Well after a few goes on some scrap material it really wasn’t as scary as I thought. In fact I have been kicking myself for not trying sooner as there has been a few projects that I have completed the hard way lol. The rolled hem makes for a beautiful finish and sews so much straighter then I think I can. And the gathering attachment on the overlocker is a lot easier then the big gathering attachment I have for my sewing machine. My next thing to overcome is shirring!!!! 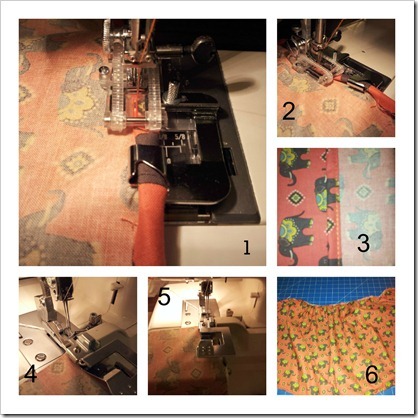 Pictures 1, 2 and 3 are of the rolled hem attachment and 4, 5 and 6 the gathering attachment for the overlocker. Sorry for the quality of the photo’s used my phone as my camera just want get that close for some reason. Do have something that you keep putting off?